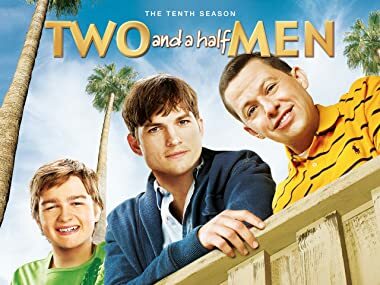 It’s been a year since Walden Schmidt (Ashton Kutcher), lovelorn billionaire, purchased the Malibu beach house where tightly-wound Alan Harper (Jon Cryer) and his slacker teenage son, Jake (Angus T. Jones), had been living. Invited to remain, Alan found himself mentoring Walden in the ways of women and, together with Jake, adjusted to their new home, making each of them a better man. On the tenth season premiere, Walden plans a big surprise for Zoey (recurring guest star SOPHIE WINKLEMAN) on her birthday. Grammy winner MICHAEL BOLTON guest stars as himself, while True Blood’s BRIT MORGAN guest stars as a woman Walden meets at a bar. Alan and Lyndsey (recurring guest star COURTNEY THORNE-SMITH) decide to spice things up in the bedroom. Walden starts to feel his age when a friend’s daughter comes to town. Actress MILEY CYRUS guest stars as Missi, the friend who comes to visit for a week and develops a relationship with Jake when he comes home from the Army. Despite Alan’s warnings, Walden starts dating Rose (recurring guest star MELANIE LYNSKEY). Walden asks Rose to move in, but she feels that it’s too early in their relationship. When Zoey tells Walden that she wants to get back together, however, he has to choose between Rose and Zoey…before it’s too late. Tired of the complications of a traditional relationship, Walden hires an actress to play the part of his girlfriend. Meanwhile, Jake & Missi plan a rendezvous at the beach house. Alan’s “smokin’ hot,” famous ex-wife Kandi (guest star APRIL BOWLBY) wants him back. Meanwhile, Berta isn’t interested in celebrating her birthday… until Walden helps make it special. When Alan helps Walden create a new identity in order to find a woman who isn’t just after his money, he encounters a new love interest (guest star BROOKE D’ORSAY). Walden juggles having two identities – rich man and poor man – and “Sam Wilson” gets a new job during the holiday season, while Alan finds himself alone at Christmas. Using Walden’s money, Alan invests in Kate’s fashion line. Meanwhile, leading a double life starts to take its toll on Walden. Walden and Alan visit Kate’s fashion show in New York so Walden can reveal the truth about his identity. What revealed, however, is a Broadway-style song and dance performance. Alan and Lyndsey’s relationship is strained when he won’t give her a key to the beach house. Meanwhile, Walden, Billy and Herb commiserate about women and relationships. Alan has concerns when Jake returns home with Tammy (guest star JAIME PRESSLY), his 36-year-old girlfriend that he’s madly in love with. Meanwhile, Walden struggles to keep a secret from Alan. Depressed about being single on Valentine’s Day, Walden tries to convince Kate to give him another chance. Meanwhile, Alan’s all-out Valentine’s Day plans for Lyndsey take a turn for the worse. When Walden runs into his ex-wife Bridget at a high-end singles mixer, they talk about getting back together. But Alan feels that she might not be good for Walden. Alan moves out after he and Walden get into a fight over a broken toaster. After Alan moves in with Herb, Walden feels bad and tries to apologize. But Herb gets in the way… because he doesn’t want to lose his new roommate. 19. Big Episode. Someone Stole A Spoon. Boys Gone Wild! Walden and Alan try to cheer up a lonely Herb, but end up living it up a little too large. When Jake cheats on his girlfriend Tammy (JAMIE PRESSLY) with her 18-year-old daughter, Ashley (guest star EMILY OSMENT) Alan and Walden get caught in the crossfire. SCOTT BAKULA guest stars as Ashley’s ex-boyfriend Jerry. Alan is devastated when Lyndsey breaks up with him, leaving Walden struggling to find a way to help him get back on his feet. Alan gets a “breakover” (i.e. post-breakup makeover)! When Walden encourages a depressed Alan to update his look and start dating again, Alan faces a moral dilemma when he attracts a married woman. On the 10th season finale, Walden dates a hot 22-year-old (HILARY DUFF), but finds himself more interested in her worldly grandmother (MARILU HENNER). Alan & Jake take a road trip.